Discovering the power of vagus nerve is something that we at the School of Chi Energy online training have focused upon in the past at a deliberately high level. Introducing students to a particular concept provides an opportunity to develop an awareness that serves as an onramp: “Chi Energy and the Vagus Nerve”. As the students’ forms become denser, better structured and the overall throughput of biophotons increase, there is a greater appreciation of the initial concept. The seed begins to develop roots and grows. 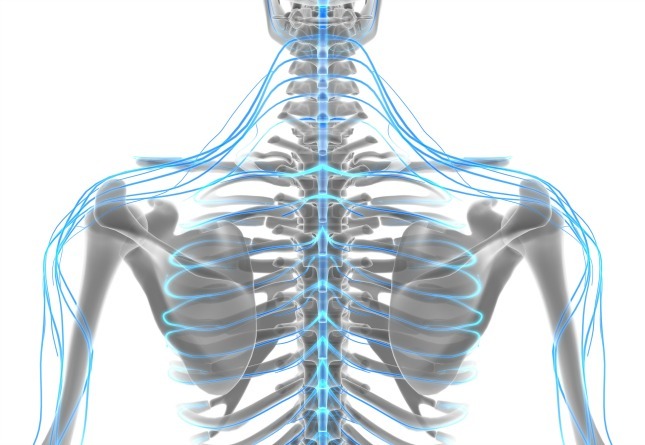 In this article, we would like to take this opportunity to draw attention to more specific aspects of the vagus nerve, its function and, most importantly, its applicability in chi training. Noted in the article, “Vagus Nerve Anatomy”, the vagus nerve extends from the base of the brain and travels all the way down through the torso into the reproductive organs, all the while branching out into and throughout the major organs in the body, facilitating and often controlling functionality and directing the flow of information. Antiquated paradigms pointed to the brain as the singular and central hub controlling all of the body’s functions. It was discovered, however, that the vagus nerve is akin to a helper brain that relates information throughout the body, from a “bottoms up” perspective. The vagus nerve branches into and throughout the human digestive tract, reproductive organs, and reaches into many of the hormonal glands, controlling the tempo of the specific organ or glands functionality all the while signaling to the brain instructions upon which the brain acts. As noted by Dr. Mark Sircus, an acupuncturist and doctor of oriental and pastoral medicine, in his article “Function of the Vagus Nerve”, the brain in effect does what the vagus nerve tells it to do – this is especially true with regards to the autonomic nervous systems. Furthermore in the same article, Dr. Stephen Porges provides insights into the perils of improper functioning of these systems, which lead to many ailments from various forms of GI distress to the multifaceted spectrum of learning disabilities. We are bringing this to the attention of the practitioners of this method now for two multifaceted reasons: the vagus nerve can either help or hinder your personal human experience, both; directly and, or; indirectly. As stated above, the vagus nerve branches out from the brain touching upon almost every organ and gland within the human body. Mindful engagement of the tri-concept will cause the vagus nerve to behave as an ally, working towards the betterment of your human body. Extending a cool form beginning at the base of the skull through the torso and down into the reproductive organs will not only pass through the organs, glands, muscles and bones along said path, but will also cause the vagus nerve itself to cool. This deliberate cooling of the vagus nerve improves functionality. Electricity is by its very nature hot and; excessive heat within the human body is the source of many ailments, including inflammation and chronic forms of stress related fatigue. Cooling the main nerve which branches into and throughout the body cools the electric impulses sent along the fibers thus cooling the overall system. Furthermore, biophotons emitted by the cells will emerge in an already cooled environment, making the control and the programming of the information stored within a biophoton much easier. The opposite is true for those who do not mindfully obey the tri-concept and deliberately cool the vagus nerve. In fact, it is more unpleasant and last longer lasting effects that impact the human host body than we care to innumerate in this forum. At this level of training, the margin for error grows slimmer with every workout. The amount of biophotons produced increases exponentially; energy is lost as an expression of heat unless deliberately cooled. The forms become thicker and hold in place longer; this creates heat unless the form itself is cooled. The electromagnetic pressure within the body fluctuates creating internal turbulence – where the fluctuation of higher and lower pressure add strain on physical and emotional well-being. When the temperature of the entire body is uniform, the pressure is uniform. The vagus nerve, when cooled, serves as a central cooling unit, reaching into and throughout the entire body, cooling and regulating the processes therein. As we continue our training, let us each mindfully engage the various components of the human body to assist in the development and cultivation of chi energy in such a way that it becomes a win-win promoting growth, health, and peace.